The wedding of Ben and Jaime, at Spinnaker Tower was followed by a reception on HMS Warrior, Portsmouth Dockyard, 15 October 2016. Jaime is from Singapore, her family were in the UK for the wedding. Jamie's Maid of Honour was her good friend Chu. Her bridesmaids Jewel, Jubilee (the bride's sisters) and Adama. Ben's Best Man Jon, was accompanied by Groomsmen Mikey, Robbie & Glenn. Adama, was also the make-up-artist. Wow, what a great professional job she did. The wedding was administered brilliantly by Stuart. 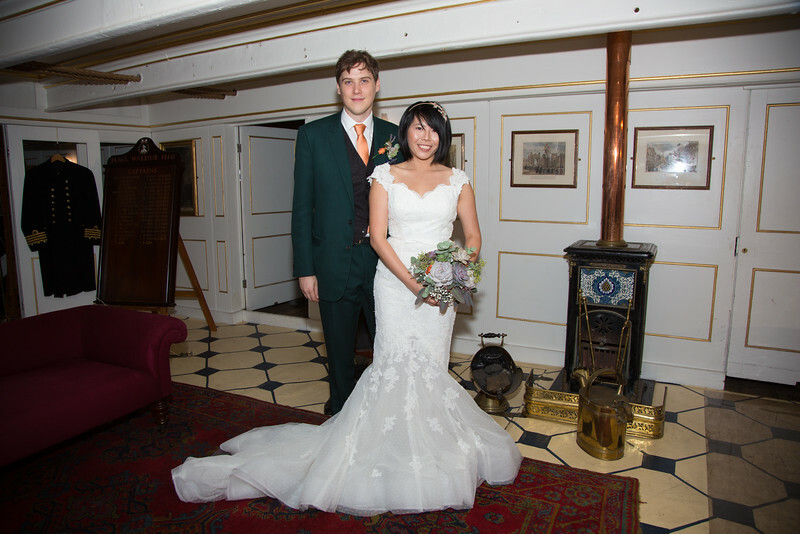 Following the wedding, guests made their way to HMS Warrior, in blustery conditions. The wine flowed, the food was wonderful and the speeches, were presented with panache and great confidence, by Jonathan, Jon and Ben. Following the speeches, the Bride & Groom cut the cake then made a bee-line for the dance floor. The all girl, live band played through till 11.30 and managed to keep virtually everyone on the dance floor throughout. All in all, this was a truly great wedding. Ben & Jaime, you smashed it out of the park!